I consider myself an evolving environmentalist, although my wife has to occasionally remind me to recycle cardboard cereal boxes and defunct newspapers, and my nostalgia for old-fashioned boatyard fragrances like red-lead primer and tung-oil varnish continues unabated. While progress on the evolutionary has been slow though, it’s also been sure. For months now, I’ve been using environmentally friendly cleaning products on the ol’ Betty Jane (including dish detergent with Aloe Vera gel and yummy plant-derived surfactants). And for the whole past year, I’ve been adding Starbrite’s Star Tron to my diesel fuel to boost economy and cut emissions. But here’s the rub. One thing continues to stand in the way of my ultimately winning the Al Gore gold-star award for maritime eco-grooviness, or at least it did until a few months ago: Betty’s 20-year-old, 135-hp Ford Super Lehman diesel. Sure, my Lehman’s an oldy, reliable as rain and far from fuelish. But she’s also a naturally aspirated reminder of days gone by: sans electronics, common rails, and other post-modern touches--like for instance, a Walker Airsep. Why a Walker AirSep? 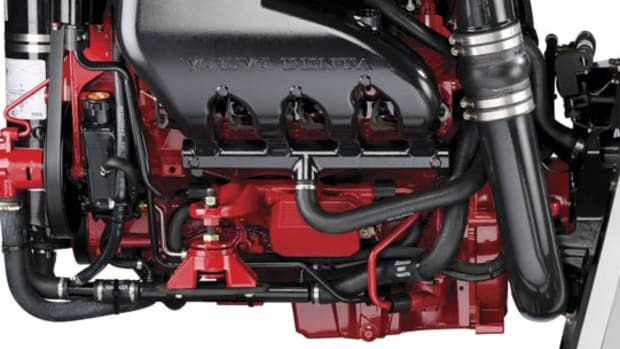 Because virtually all diesel engines--new or old, turbocharged or naturally aspirated--exhibit a pollution-producing foible called "engine blow-by." My Lehman, for example, has an automotive-style vent cap smack-dab in the middle of its long chrome valve cover--an embellishment we Lehman owners affectionately call "the chrome dome." 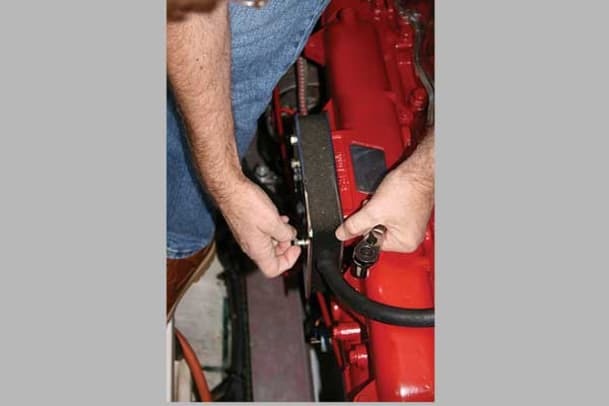 It serves a straightforward function: relieving the pressure buildup inside the area above the valves that results from exhaust gasses escaping around the valve guides--the blow-by. Nasty stuff, blow-by. 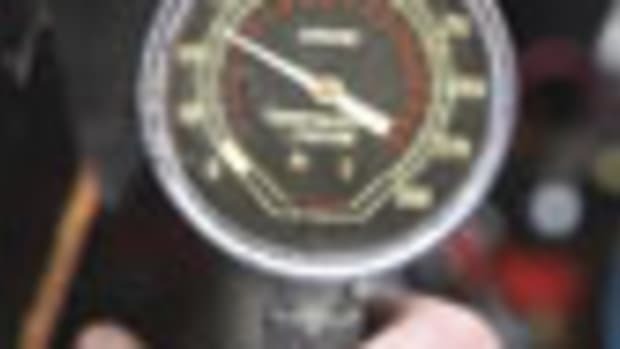 It’s essentially an unholy melange of atomized lubricating oil, unburned fuel, exhaust, and water vapor that blasts upward past the valves or downward past the piston rings during combustion. 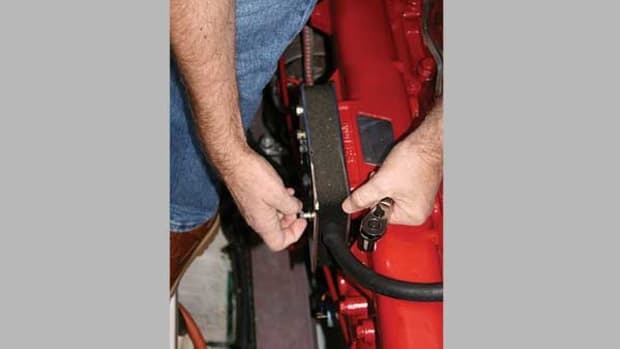 It enters and thereby pressurizes either the area above the cylinder head or the crankcase, a happening that can produce efficiency losses, oil leaks, gasket blowouts, and the dispersal of smelly oil vapors and other contaminants around the engine room. On my naturally aspirated Lehman, the vent cap deals with blow-by in rather basic fashion: It’s fitted with a rubber hose that simply dumps vapors and particulates into the air cleaner. Sponge material inside the cleaner absorbs some crud as it whooshes past, but much of the stuff continues on into the engine’s intake runners and cylinders, where it gets burned and shipped out the exhaust port. There are drawbacks to the system. Over the years I’ve learned to live with small puddles of oil, or at least a light film of oil around the vent cap, particularly after operating the engine for a few hours at cruise speed. 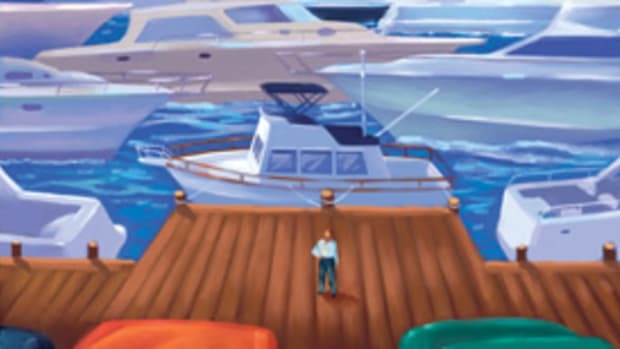 And from the day I first sea-trialed her, the mixture of gases and water emanating from Betty’s transom-mounted exhaust has seemed a tad oily to me and others, leaving a bit of a sheen on the water. Evolving environmentalists get lucky sometimes. Some six months ago I was talking with Mike DeLillo of Walker Engineering, and he offered to send me a Walker Airsep retrofit kit for a little long-term testing on the Betty Jane. I was initially skeptical. 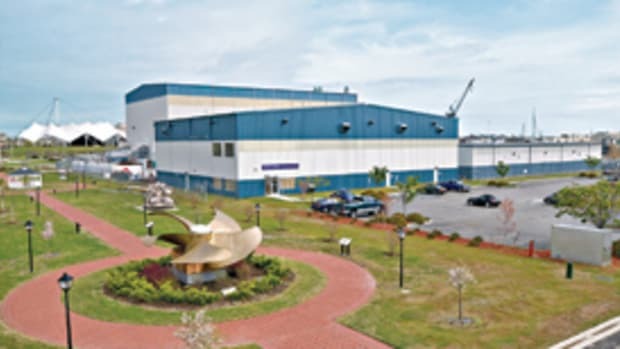 Certainly, I was convinced of the Airsep’s efficacy for new, turbocharged diesels--I’d been seeing factory-installed Airseps on new engines of nearly every make and model during decades of boat testing. "But what about a 20-year-old, naturally aspirated Lehman?" I asked. "You think an Airsep’ll work?" DeLillo’s response was heartening. 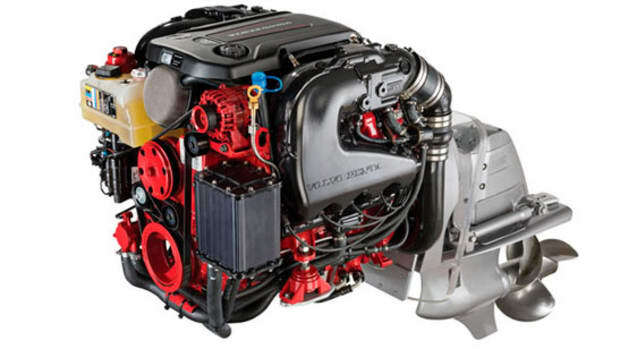 Walker, he said, makes do-it-yourself retrofit kits for virtually every marine-diesel engine, new or old, turbocharged or naturally aspirated. 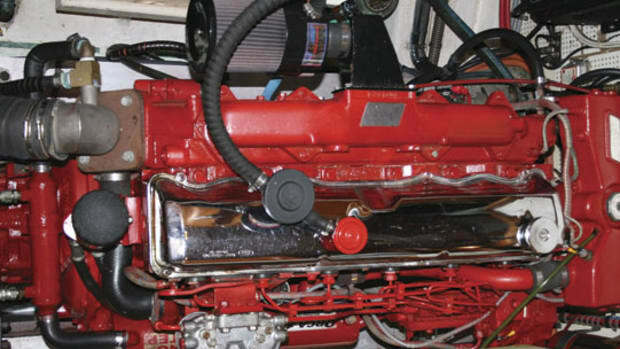 And he added that even old-school engines like mine can benefit from an Airsep. The reason? 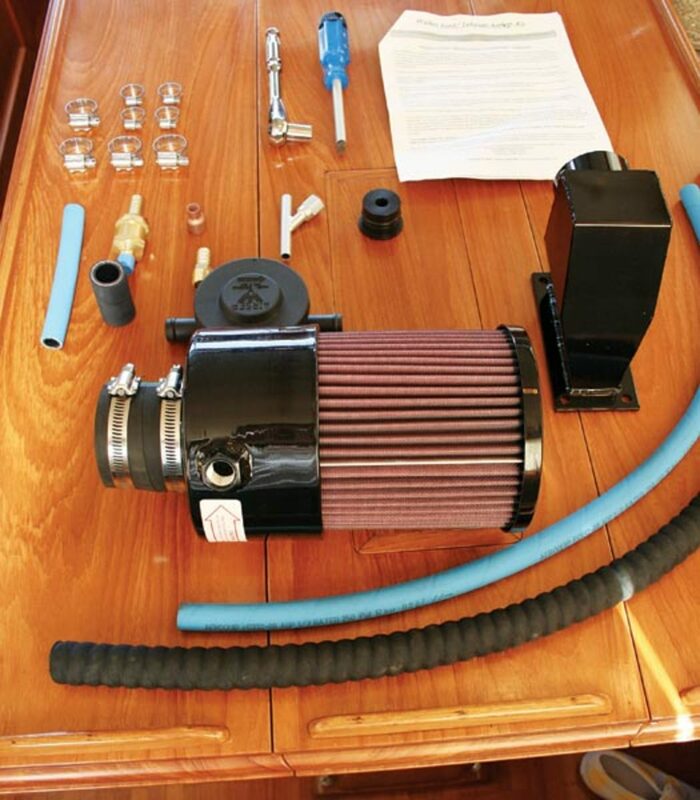 According to DeLillo, the Airsep closes the route by which blow-by travels by means of a vacuum regulator, a washable, high-performance air filter that both traps particulates and extracts and liquifies oil vapor, a drain hose that returns the oil to the crankcase, and several other pieces of proprietary technology. 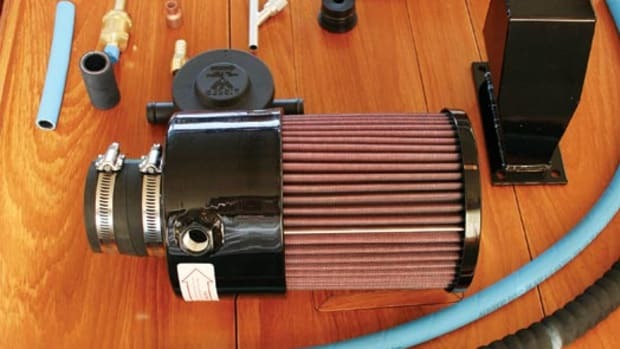 Because the Airsep system is closed, it engenders a vacuum not only in the crankcase but throughout the rest of the system, so oil vapors and unburned fuel are much less likely to escape into the environment. "Instead of going out Betty Jane’s exhaust port," DeLillo explained to me, "the bad stuff either gets trapped in the filter or is returned to the engine." It’s been ten months since I installed my retrofit kit (see "A Mere Two-Hour Job," this story), and my take on its performance is a rousing thumbs-up, with one caveat: The reasons for the changes I’ve noticed are difficult, if not impossible, to experimentally identify or quantify in the field. Nevertheless, there’s no denying the absence of oil on my Lehman’s chrome valve cover these days. There’s no denying the tangible reduction in the sheen on the water below Betty’s exhaust port. And there’s no denying the aesthetics of the new situation--an Airsep beats an oil-absorbent-sponge-filled air cleaner for cleanliness and the appearance of cleanliness any day of the week. Don’t get me wrong, though. I’m not saying DeLillo and Walker Engineering have radically changed my life. Betty’s engine room isn’t noticeably cleaner now because, quite frankly, it was always pretty darn clean to begin with. 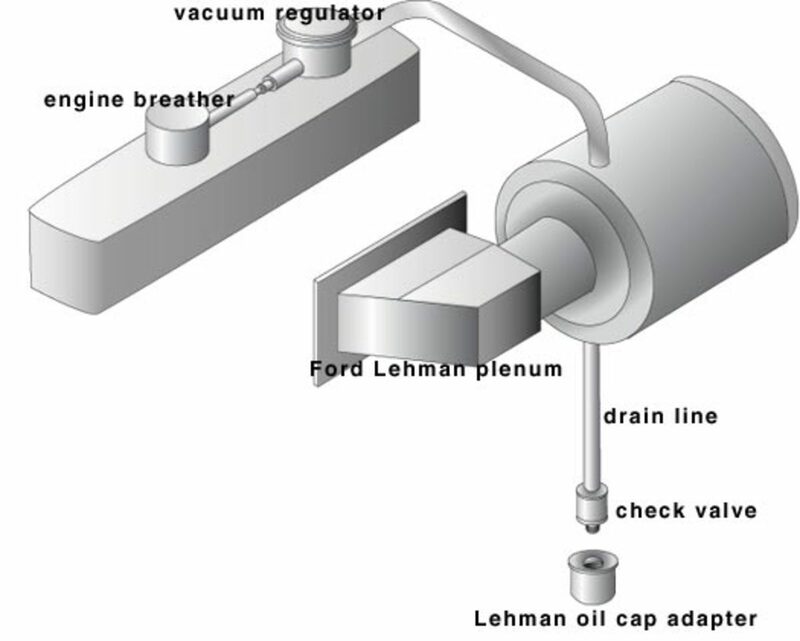 A naturally aspirated Lehman, after all, is a low-horsepower engine that generates comparatively little blow-by and therefore tends to disperse comparatively little blow-by-induced oil vapor. But here’s the deal. If an inexpensive, easy-to-install Walker Airsep dusts an old Lehman like mine with a faint patina of clean-and-green environmental correctness and concomitantly cuts emissions by a noticeable amount, this is one evolving environmentalist who’s onboard with it. Read more of the do-it-yourself installation on the next page.